2. Have obtained a law degree (Bachelor of Laws, State Examination or equivalent) or be currently studyingin a law degree programme. 3. Be proficient in English, demonstrated by being a native English speaker, having completed undergraduate studies in English, or by holding a valid TOEFL with a minimum score of 100 or an IELTS 7.0 or a Cambridge Test for Advanced English (CAE) certificate. The application deadline for the 2019-20 CLTE programme is 1 June 2019. All students enrolling must bring originals of these documents bearing their signaturetoregistration. The China-EU School of Law carefully evaluates each applicant based on the application materials submitted. Admission is based on merit. Thus, it is recommended that all applicants provide the school with any materials that can demonstrate their achievements. The school considers geographical, cultural and ethnic diversity of students as one of its greatest assets. The law school does not hold an entrance examination for international students. 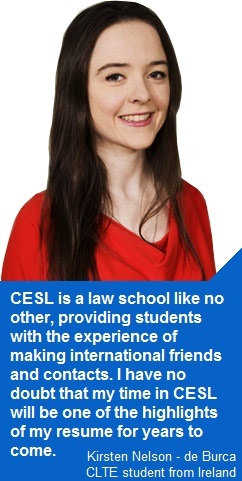 However, CESL may conduct interviews by telephone, with alumni, or use other ways seen as necessary to assess potential candidates. Applicants are informed via email of the admissions decision. Successful applicants receive their letter of admission via post, including the Student Visa Application Form (JW202 Form) issued by the Chinese Ministry of Education; students can then apply for a visa and book their flights. The semester starts at the beginning of September.